Kamen Rider Ex-Aid VRX Creator Gamer Form Revealed! A new form for Kamen Rider Ex-Aid has been revealed thanks to a press conference for the upcoming summer movie Kamen Rider Ex-Aid: TRUE ENDING! This is Ex-Aid VRX Creator Gamer! By using the power of Virtual Reality (which is apparently integral to the films’ plot), Ex-Aid can create all-new weapons and attacks. Gaming fans may recognize the Playstation VR used to create this new form, appearing thanks to a special agreement with SONY. Kamen Rider Ex-Aid: TRUE ENDING will be released on August 5, 2017! Stay tuned to TokuNation as we keep you up to date on all Kamen Rider news! 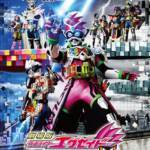 It’s time for another Kamen Rider Ex-Aid movie, with rumours and toy catalogue images for this upcoming summer flick having surfaced online. Of course, the movie will be debuting new Gashats and forms for the Riders. 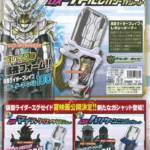 Taddle Legacy Gashat: for Kamen Rider Brave and with it can become Kamen Rider Brave Legacy Gamer lv 100, his strongest form yet. Mighty Creator VRX Gashat: for Kamen Rider Ex-Aid will be Kamen Rider Ex-Aid Creator Gamer and be able to use virtual reality abilities. Hurricane Ninja Gashat: user is not yet determined. user can become Ninja Gamer. Of course, take this news with an ingestion of salt stay tuned and we’ll bring more up to date info as it becomes avalaible.